On a recent Sunday evening our house fell under the shadow of a looming work week. A cocktail was needed to lift our spirits. Besides, we had recently purchased some new (to us) cocktail glasses at the Salvation Army (a great source for cheap, nice glasses, by the way) and needed to christen them. We had rye in the house but no sweet vermouth, so Manhattans were out. We did have dry vermouth however, and in lieu of a Maraschino cherry there was Maraschino liqueur. Since were were improvising, we reached for the Fee Bros. Orange Bitters instead of Angostura, stirred it all up and gave it a try. Due to liberal use of the bitters it was very orange-y and that, combined with the toasty rye was just the thing for a freezing winter night. As we sat sipping away the blues we wondered what to call it. It wasn’t a Manhattan but it was an almost Manhattan, so of course it should be called a Marble Hill. For those of you who don’t live in New York City, and those of you who do, but aren’t as obsessed with weird tidbits of history as I am, here’s the story of Marble Hill. It’s a neighborhood that used to be geographically located at the very northern tip of the island of Manhattan. As you may know, the river (well really at that point it’s a tidal estuary) to the west of Manhattan is the Hudson, and the tidal strait (no, it’s not really a river) to the east of the island is called the East River. Connecting the Hudson and East Rivers and going around the top of the island is another tidal strait called the Harlem River. In the late 19th Century it was decided that a ship canal needed to be created to allow larger ships to be able to navigate easily from the Harlem River to the Hudson River. The canal, known as the Harlem River Ship Canal, was dug through one of the narrowest parts of Manhattan, just south of the neighborhood of Marble Hill. After it’s completion in 1895 Marble Hill was an island surrounded on three sides by the original path of the river and to the south by the new ship canal. In 1914 the part of the Harlem River that flowed north of Marble Hill was filled in, connecting the neighborhood to the mainland and making it geographically part of the borough of the Bronx. Over the years there have been many arguments as to whether Marble Hill should be considered part of Manhattan or the Bronx. A particularly weird episode occurred in 1939 when the Bronx Borough President at the time, James J. Lyons, planted a Bronx County flag in Marble Hill and demanded that the residents declare their allegiance to the Bronx. He even went so far as to call Marble Hill “the Bronx Sudetenland,” a reference to Hitler’s 1938 annexation of Czechoslovakia! The residents of Marble Hill smartly gave him a raspberry (I won’t call it a Bronx cheer) and sent a petition to New York’s Governor to remain a part of Manhattan. It took a while but in 1984 the New York State Legislature passed a law declaring Marble Hill a part of Manhattan. Unfortunately, residents must put up with a ZIP code beginning in 104 instead of the coveted Manhattan 100 and in 1992 their area code was changed to from 212 to 718 along with the Bronx. However, to avoid confusion they are listed in both the Manhattan and Bronx phone directories. Next time you want to win a bar bet, ask your opponent to name the northernmost neighborhood in Manhattan. It turns out there is already a cocktail named for Marble Hill which contains gin, Dubonnet and orange juice. But I say if there can be multiple Corpse Revivers then there can be multiple Marble Hills too, so here’s ours. Combine liquid ingredients with ice and stir to chill. 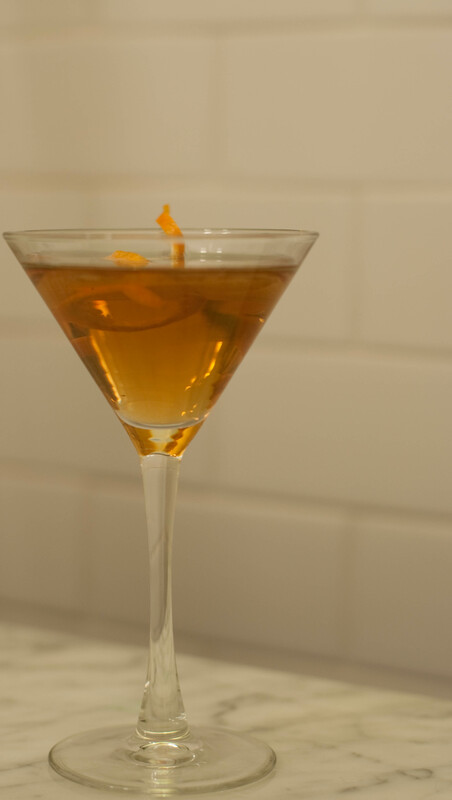 Strain into proper 4.5 ounce cocktail glasses and garnish with a twist of orange.